The Largemouth Bass. the most popular game fish of them all. There are many reasons that make the Largemouth Bass such a popular game fish. There are more then fifteen million anglers in the USA alone that pursue the Largemouth. Most of these people are “hooked” on this great fish. Their passion for the pursuit is unmatched by any other game fish. Sure, there are other fish in the water but the Largemouth is THE fish! These avid fishermen spend many hours and a ton of hard earned monies on the sport that defines them. They have fancy boats decked out with all the latest electronics. They own dozens of rods and reels and most if not all have hundreds of lures and stuffed full tackle boxes. The equipment options are unlimited. There are spinner baits, crank baits, top water baits, soft plastics and endless types of hooks for every situation a person can imagine. There are baits for every budget from small to deep pockets! The tackle is almost as addictive as the fish! Why is this fish so popular? They are found in all of the lower 48 states, parts of Canada, parts of Mexico and even in Cuba. Any passion driven bass fisherman or woman can chase their prey with in a short distance of their home no matter where they live. The Largemouth Bass is a strong fish that can put up a fight unlike any other fish. They can break the surface of the water and throw your lure at any time. They can wrap you up in the weeds or around a stump and break you off. They can snap your line or break your rod on a whim. They can make you look like a fool or a hero all in the same day. They have to be the most fun of all fish to catch. They may not be the biggest but they are the most addictive. You can fish for the Largemouth Bass at anytime of the day or night and on most days or nights you can catch them. Sure, there are better times like dawn and dusk but anytime you can get on the water is the right time. People need more recreation and this is a good way to recreate! Time spent on the water is time spent refreshing your mind and spirit. 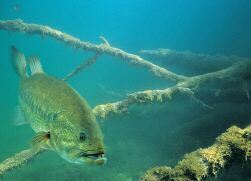 Last but certainly not the least of the reasons behind their popularity is the fact that the eating habits of the Largemouth Bass is wide and varied. They will eat anything and everything that gets in their way. They will bite just about any type of live or artificial bait thrown their way. They feed in deep water, they feed in shallow water and they feed anywhere in between. Bottom line is that the Largemouth Bass is always feeding. If you don’t catch them here, try over there. Sooner or later you will find a hungry one. To understand the popularity of this fish, all you have to do is hook up with one and the passion will begin! Once a fisherman or woman gets hooked on this popular fish, watch out. It can consume your time and money like no other. Just look at the shelves of any sporting goods store that sells fishing equipment. A couple spots for every other type of fish and rack after rack of bass fishing tackle. When a fisherman or woman can’t get out on the water, many times you will find them in front of the TV or reading up on their favorite fish. There is so much to learn about the Largemouth Bass that a person could watch TV, read books and articles or experiment on the water for the rest of their Bass chasing years and never stop finding new ways to catch them. If you doubt the passion that this fish fuels, just go ahead and catch one the next time you are on the water and you too will be “hooked”. Too understand the Largemouth Bass is too understand the fisherman or woman that pursues it. Both are fueled by the passion of the chase! The more you fish for this mighty beast the more the passion grows. I know this is my favorite fish and it just might become yours as well.